Six Seconds members with Lea Brovedani at the South Africa Summit. Photo from Jonathan Low. 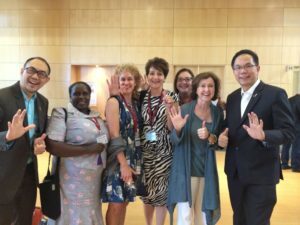 In an interview with Robin Hills from Ei4Change at the South Africa EQ Summit, Lea Brovedani shared how she got involved in the emotional intelligence community, and how that’s informed her work on TRUST. “I was using an instrument that Six Seconds created called the OVS, Organizational Vital Signs, and what the OVS did was measured organizational climate, and it gave a trust measure. What I started observing was: You can see the emotional intelligence of the organization and people by how much they trust each other. Then trust started to really interest me. The mechanics of trust. Could you grow trust? Six Seconds talked about trust in terms of caring, consistency, commitment, competence — and I added communication as the bedrock. For trust to be real, you have to communicate. People have to hear it – and to feel it. For trust to be real, you have to communicate. People have to hear it – and to feel it. For more information on Lea Brovedani’s work, check her author page on 6seconds.org: Lea Brovedani on Trust and Emotional Intelligence. Lea is the author of a powerful parable about trust — how it’s broken, and how a leader and rebuild it… starting by learning to trust himself. Hunter Birkett, CEO, has it all — except the skills to build trust. When Hunter first appears, he is bankrupt – financially and spiritually. TRUSTED is a tale of a leader’s rise and fall — and the story of all managers working to become leaders, committed to building strong relationships and true performers. 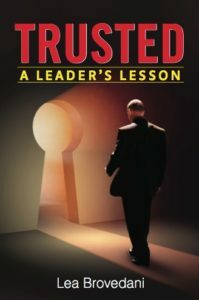 A book for every leader, TRUSTED is the perfect blend of inspiration, struggle, humor and practical advice. [mp_buy_button product_id=”8872″ context=”single”]In an engaging narrative about a senior leader’s fall and rise, Lea Brovedani offers powerful, practical lessons for every leader, and every person.